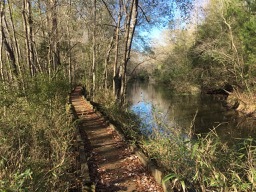 Old Santee Canal Park, located in Moncks Corner, SC (About 45 minutes from downtown Charleston) offers several trails with varying degrees of difficulty and terrain. The Canal trail, pictured in purple on the map, offers easy to moderate hiking with some elevation changes. 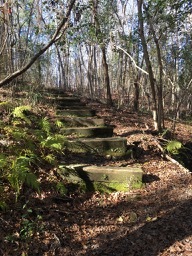 It follows a scenic wooded path along a river mixed with earthen stairs and narrow boardwalks crossing swamp lands. 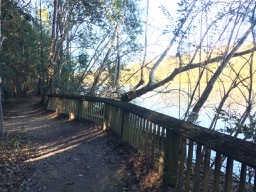 The initial portion of the trail leading to the original canal viewing area/canoe docks can be done with an all terrain stroller, however you will have to turn back and return along the river path to avoid multiple sections of stairs. A child carrier is necessary to do the entire hike loop if you don’t have a walking child. 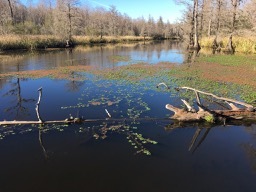 This trail can be done with young walkers but sections along the narrow boardwalk and stairs may require either hand holding or a hiking harness/back pack leash, for safety and peace of mind. The scenery is well worth it however and this is one of the few areas in the low country with bluffs and elevation of any kind. You have multiple options for reaching the Canal trail, either starting on the Osprey loop near the Stony Landing house or by exiting through the rear of the Interpretive center (Note: Stairs lead out onto the the boardwalk from the interpretive center) The other option for accessing the Canal Trail is to follow the gravel access road near the Childrens Garden down to the Alligator loop and follow it until it connects to the Canal trail. With the exception of accessing the trail through the interpretive center, both of the other options are all terrain stroller friendly. 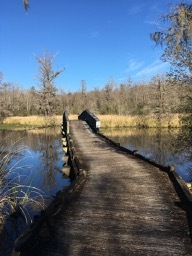 This is a great trail for experiencing a variety of scenery with river views, foot bridges over water, wooded trails and boardwalks through marsh and swamplands. Due to bugs and the heat, I recommend this trail for fall, winter and spring, however, it can be done in summer, just bring plenty of water and bug repellent! This hike is shaded almost the entire way through and has a nice shelter with benches about halfway through, at the canoe dock/canal viewpoint, perfect for a picnic lunch or snack break. There are also multiple picnic shelters near the parking lot, an interpretive center, a local history museum and a playground on site. $3 fee for persons 6 and older with season passes available. 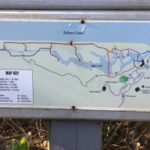 Old Santee Canal Park is easy to find through navigation and internet map services.